Yeah. 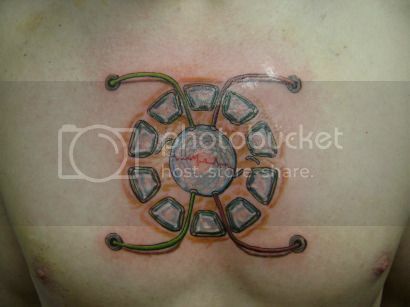 This guy’s got an Iron Man tattoo of a miniature arc reactor right in the middle of his chest. As if drawn by a skillful, right-handed 11-year-old using his left hand. Yeh, I might scrape that thing off with a rusty spoon and try again. Kinda reminds me of the press-on tattoos my first grade students wear . . . Nah, they’re usually a bit better drawn.